Eggs are one of the few no-fuss dinner options that I will happily entertain on nights when my enthusiasm for cooking is running as low as the inventory of my pantry and the balance in my bank account, combined. I decided that such an egg dinner would become my fate two nights ago when I caught myself staring at my refrigerator door in a state of post-Lady Gaga concert fatigue as drool ran down my $40 Joanne tour tee-shirt. It was evident that I needed something more nourishing than a bag of baby carrots before my body collapsed in fatigue on the nearest horizontal surface. Click through to see the title on Amazon! I had two blessings working in my favor in this bleak scenario: the first was a leftover batch of brown rice and lentils with caramelized onions and the second was a copy of Acid Trip: Travels in the World of Vinegar by Michael Harlan Turkell, which was sent to me by the kind people at Abrams Books when I was inducted into the 2017 Abrams Dinner Party(!). Membership in this group gives me access to cookbook titles published by Abrams weeks before they hit the shelves. That way, I can test recipes from them and provide you with a hot take on food babies that eventually need to enter your mouth hole. I'll be working through a bountiful roster of titles, so if you're hard-up for dinner one evening and live off of a subway stop that isn't shut down for maintenance by way of a flash mob, give me a call and I'll come over to share the fruits of my labor. I also learned that I will need to build a small glass-enclosed room above my kitchen and lovingly refer to it as "the skybox" if I'm serious about chasing Boulud's caliber of culinary excellence. Vine-gahr. While I hope to have the patience someday to try complex recipes from the book (Brains in Black Butter, anyone? ), the Fried Egg with a Spoonful of Vinegar recipe from Bertrand Auboyneau of Paris’s Bistrot Paul Bert was all I could manage to make that Tuesday without crumbling to the ground like a bag of crushed Girl Scout cookies. When I tell you that this egg only required three minutes of my time, I mean it just as sincerely as Real Housewives of New Jersey's Caroline Manzo meant it when she tearfully convinced her son Albie that he's not "friggin' worthless." Fry the egg as you normally would, with a knob of butter (or a tablespoon of ghee), over medium-high heat. Gently tilt the pan and spoon your fat of choice over the whites of the eggs to help them set while crisping the edges. Shimmy the egg onto a hot plate once the edges have browned and season it with salt and pepper. While the pan is still hot, add the white wine vinegar and let it reduce by half over medium-high heat. Spoon the reduced vinegar over the egg and garnish it all with your chopped herbs. 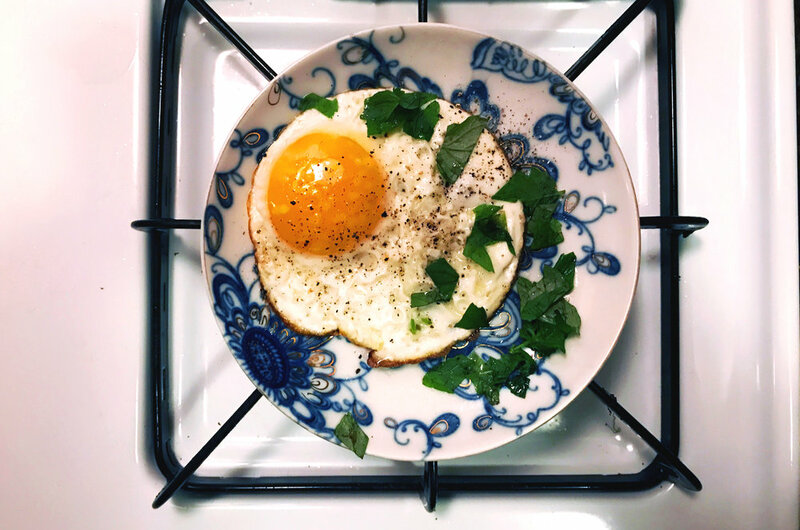 I accidentally used mint and basil (all of the leaves in our windowsill garden looked the same to my tired eyes), which unexpectedly rounded out the acidity of the vinegar while brightening the low notes of the egg yolk. When I closed my eyes to ~consciously~ evaluate this dish, my senses were transported to the ten-dollar salt and vinegar fries that my friend ordered as a pre-Gaga snack at the concert the night before. However, as I write this now, I realize there's a chance that this entire recollection was just a dream that fell upon an exhausted young woman who fell asleep while standing upright in her barren kitchen. Should I make this egg again and eat it over a basket of french fries? ?